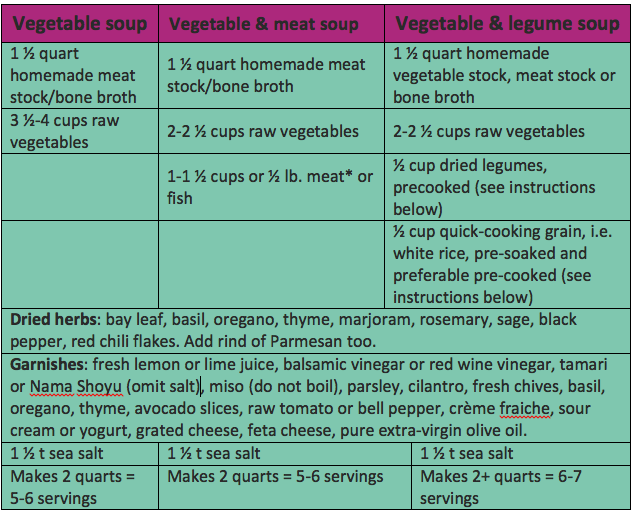 This post will teach you the basic formulas for how to make vegetable soup so you can make your own delicious soup at home like a pro without relying on a recipe. I recommend to my clients who find it challenging to put a well-rounded meal on the table every day to make a large pot of soup on the weekends and eat it throughout the week—for either lunch or dinner, and even breakfast. You can freeze soup in serving sizes (i.e. pint or quart) and reheat later in the week or next month. Freeze in a plastic container so it can be removed from the container partially frozen. It’s a one-pot meal: protein and vegetables, and optional grains. No need for sides unless you have extra time for salad. It can taste even better the next day. It’s an excellent way to eat more mineral and gelatin-rich meat stock or bone broth. (When I was on the GAPS diet I ate soup almost every day to get in my daily gut-healing bone broth). It’s an excellent way to eat a variety of vegetables. 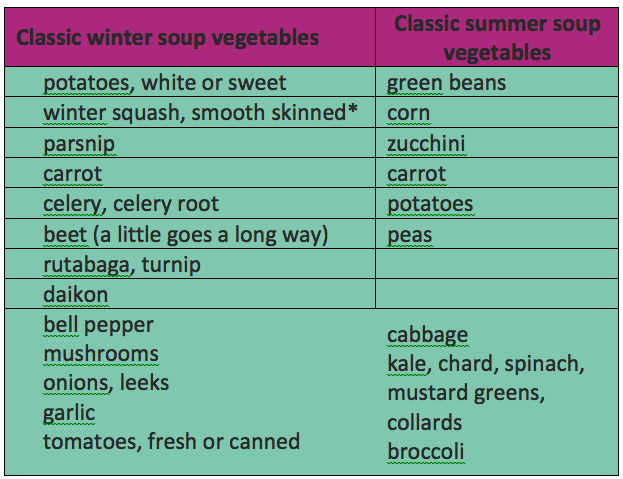 Here are the basic formulas for making a vegetable-based soup. Increase by 50% or 100% to make extra to freeze. (I like to make enough to provide three meals and have leftovers to freeze). When you are busy and need to put food on the table, thaw it in the fridge the night before or that morning. * Examples of meat include ground meat, sausage, leftovers from making pot roast or roast chicken, or a ham hock or ham bone. * Choose smooth skinned winter squash so you can peel it easily before cutting into chunks. You can also buy a 10 oz. bag of frozen vegetables. This comes to 2-2 ½ cups—exactly what you need for a pot of soup. Take out of the freezer to thaw on the counter when you begin cooking. The frozen veggies have been blanched so they can be added in the last 5 minutes of cooking. Heat a large heavy-bottomed pot to medium heat. Add 2 T ghee or coconut oil. Add onion, leek, mushrooms, and sprinkle of salt to draw out the moisture so vegetables can caramelize. They should be hot enough to sizzle. Cook until onions and mushrooms start to brown, about 10 minutes. Add garlic, carrots, celery and dried herbs. Sauté until they begin to soften, about 5 minutes. Remove the vegetables to make room for browning the meat. Add ground or chopped raw meat and brown, about 10 minutes. Add the just-cooked vegetables, hardier raw vegetables, stock/broth, canned tomatoes, leftover pre-cooked meat, pre-cooked legumes and pre-soaked and/or pre-cooked grains. Turn up the heat to high and bring to a boil. Turn down the heat to low and simmer, covered, for 20 minutes. Add in quicker-cooking vegetables the last 15 minutes. If using frozen vegetables or dark leafy greens, add in the last 5 minutes of cooking. Puree the vegetables completely or partially with an immersion blender, if desired. Add sea salt, fresh herbs and garnishes. *Garlic is best consumed raw or cooked after having been exposed to the air for 10 minutes (source). This exposure increases garlic’s allicin content. Allicin is a compound that kills bacteria and viruses and helps to fight disease. 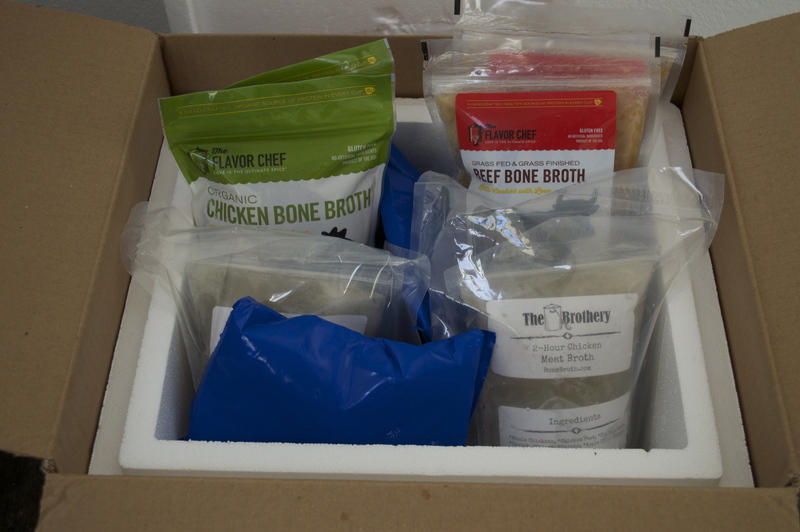 Make your own meat stock or bone broth–or have it delivered to you! But whatever you do, DO NOT use bouillon. This is not healthful nor healing. Bouillon often has MSG (not allowed in organic brands) and other harmful additives, including yeast extract and maltodextrin (allowed in organic brands). “Natural flavor” could include MSG too! In fact, bouillon isn’t even made with bones and may not contain meat at all. Below are ingredients of Knorr chicken bouillon. The third ingredient, after salt and palm oil, is MSG. Notice the Yellow 6? No spank you! Does making meat stock or bone broth seem overwhelming and too time consuming? 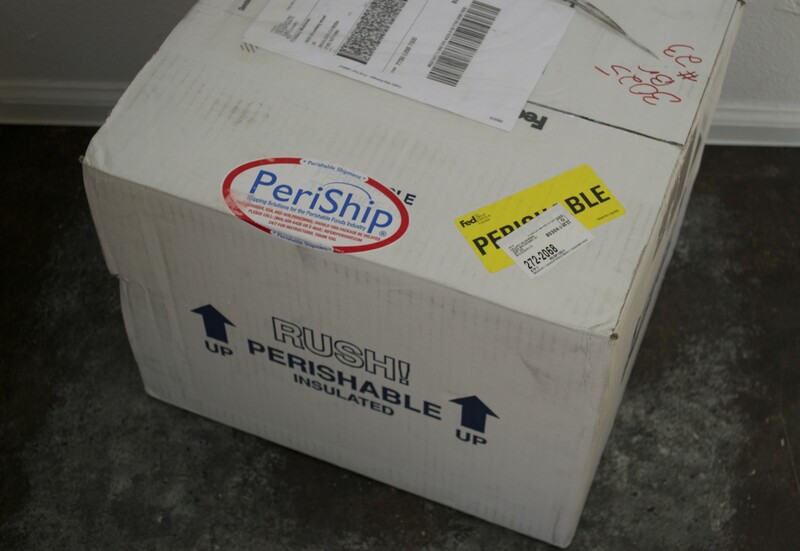 You can order pure chicken or beef bone broth online and have it delivered to you frozen from The Flavor Chef in the San Diego area. They ship to anywhere in the continental U.S. Ingredients are organic and simple: pure water, meat, bones, vegetables and spices. And let me tell you–it’s super tasty! It will turn your soup from so-so to amazing. I first met Chef Lance and tasted his bone broth at a nutrition and health conference in 2014. 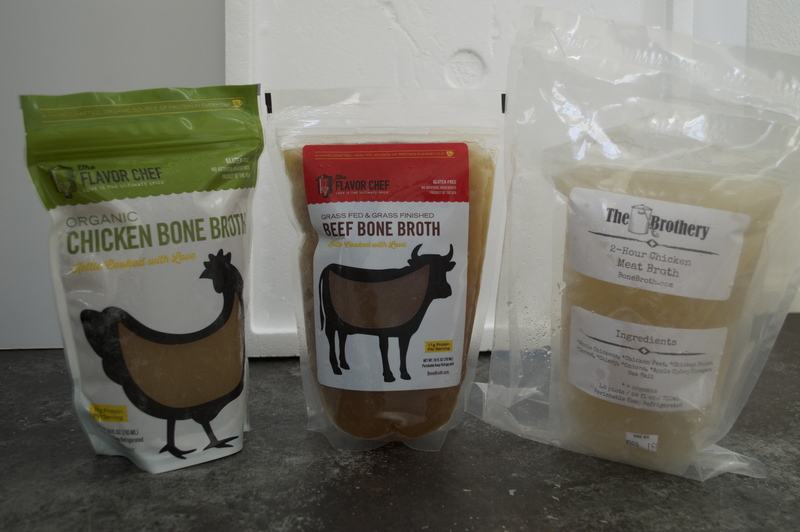 He makes 18-hour chicken bone broth, 24-hour beef bone broth, and 2-hour chicken meat stock. Call to request the short-cooked stock, appropriate for those on GAPS Intro and those with sensitivity to glutamine. You can order at bonebroth.com. Grains and legumes need to be soaked in a neutralizer in order to make use of all the nutrients it contains and improve digestibility. Soaking in water in an acidic medium neutralizes the enzyme inhibitors and phytic acid found in all legumes and grains. The enzyme inhibitors block digestive and food enzymes from doing their job of breaking down your food. The phytic acid binds with the valuable minerals in the food and prevents our absorption and utilization of such minerals. Cooking low and long also ensures greater digestibility. Rice: Place ½ cup dry white rice in 2 cups hot filtered water and 1 T whey, yogurt, lemon juice, or apple cider vinegar. Soak for 12-­‐24 hours. If it will be cooked in meat stock or bone broth, it doesn’t need to be soaked in neutralizer. Cook 1.5 hours on low. White rice is the most easy to digest grain. Lentils: Place ½ cup dry lentils in hot filtered water (after simmering) with at least 2 inches to spare + 1 T whey, lemon juice or apple cider vinegar. Soak 10-­‐12 hours. Drain and rinse, if necessary. Cook with 1 cup filtered water for 40-­‐60 minutes. Aduki, lima, navy, pinto or other kidney shaped beans (but not black beans): Place ½ cup dry beans in simmered water with at least 2 inches to spare + a pinch of baking soda. Soak 18-­‐24 hours. Drain, rinse, and cover in pot with 2 inches of water to spare and a strip of kombu. Cook 1-­‐1.5 hours. Kombu is dried kelp and comes in a package in the Asian section of the grocery store. All kidney shaped beans (except black) require kombu for cooking to break down the oligosaccharides (complex or long-chain sugars) that cause bloating and digestive issues. It also imparts minerals.